Located in the state of Florida, Weston is a medium-sized city with a population of 68,893 residents. If we look at the most recent Census, Weston is known to have a predominantly White population. The next two most common races are Black and Asian. Additionally, more than a quarter of the population of Weston are of Hispanic or Latino origin, and 51% of the population also speak Spanish. 81% of the people in Weston (over the age of 15) are married and 41% have kids under the age of eighteen. Knowing that, it’s safe to say that this area could be a great place for other families to lay down roots. Whether you’re relocating to a new town to be closer to family, friends or for a new job, living in Weston could be a positive experience compared to other cities in Florida if you know where to look. 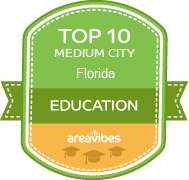 To help you find the best places to live in and around Weston, AreaVibes has created a livability score using key metrics like amenities, education, employment, housing and more. Weston, FL receives 81 out of 100 for its livability score; this results in a ranking of #125 in Florida and #1,236 in the USA. Pack your bags! This is a very high score in comparison to other US cities. Living in Weston could be a great choice! Weston has also earned the rare honor of ranking in the top 10 percentile among all cities. There are seven total categories that create the livability score. Weston scores well for amenities (A+), crime (A+), weather (A), education (A+) and employment (B-). Weston does not score well for the following: cost of living (F) and housing (D-). It might be a smart idea to take a closer look at each category to find out why. Conveniently located amenities and interesting attractions are a great way to continuously enjoy Weston on a regular basis. Knowing that there are an abundance of amenities and things to do can ensure that you always have access to nearby grocery stores, restaurants and coffee shops. Some of the interesting things to do and attractions include: Bonaventure Country Club, Red Door Lifestyle Spa, and Little Java's Family Fun Center. Feeling a sense of safety in the area that you live in is a must for most people. Low crime rates can have a positive impact on things like home prices, home appreciation rates and the overall sense of community. Weston has a violent crime rate of 58 crimes per 100,000 residents which is far lower than the national average. The average school test scores in Weston are 79%. This far exceeds the national average and ensures that this educational system will provide your children with the skills and the tools they need to thrive. Assuming that Weston meets all of your requirements, the next most important item to examine is the affordability of real estate in Weston. Everything else becomes a lot less important if it turns out that home prices in Weston are simply unattainable. Median real estate prices in Weston come in at $414,100, which is 148.3% higher than the Florida average. The home price to income ratio compares the median home prices to the median household income. In Weston, the home price to income ratio is 4.4, which is 29.4% higher than the Florida average. Purchasing your new home can come with many financial benefits, some of which are more lucrative than others. Perhaps the most notable benefit could be the appreciation of your new home. Home appreciation rates are a good way to generate tax-free equity on a long term basis. The year over year appreciation rates in Weston were 4.9%, and the 5 year appreciation rates came in at 6.9%. How Do You Rate The Livability In Weston? Weston, FL; Sunshine and Much More! I have had many trips to Weston, FL. Although I am not a resident, a few members of my immediate family are and taking advantage of visiting them in sunny south Florida is a perk for me. The first thing I notice about Weston is that it has less retirees than some of the other parts of South Florida. It is very family-centered with lots of playgrounds, parks and community swimming pools. Weston is a master-planned town, with many different self-contained communities. I think the people that choose to live in Weston are career minded with families that want newer homes and good schools. Some of the communities are gated; some residents can walk to town centers. Weston has sidewalks throughout most of the town. You will usually see lots of kids out playing, it's apparent that adult's feel comfortable letting their kids go out and play. There is plenty of shopping and places to eat in Weston. There are the normal chain restaurants and also quite of few non-chain places, which I prefer. One of my favorite is Tarantella Ristorante; this is a fairly priced casual Italian restaurant. I recommend the pizza at Tarantella, I cannot think of a time I visited Weston and didn't enjoy this place. Unfortunately, if you're looking for nightlife you may be disappointed in Weston. There are a few places but not much of a variety. For the most part, nightlife is not an issue for me when I visit my family but from what I have heard people searching for some late night fun usually head to Fort Lauderdale or other coastal Miami-Dade county areas. As far as South Florida goes, I think Weston offers a great lifestyle. The Atlantic Ocean is an easy drive; the town is kept immaculate and offers just about every convenience you could need on a daily basis. If you're looking for old unique charming architecture you will be disappointed, besides that Weston has convenience, cleanliness and opportunity for many lucky families who call it home. Source: The Weston, FL data and statistics displayed above are derived from the 2016 United States Census Bureau American Community Survey (ACS).